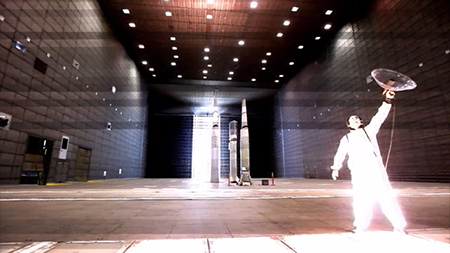 Charles Lindsay and Bruce Coffland discuss their experience working at NASA Ames Moffett Field from their respective points of view of as an artist-researcher and a NASA Operations Manager (Earth Science Office). Janna Kaplan and Heidi Neilson will each present on topics relating to human survival in outer space. 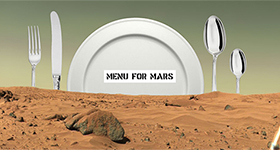 Kaplan will discuss the tasks and challenges of preparing astronauts for spaceflight, while Neilson will present her Menu for Mars Supper Club project. On the final day of Setting Out, apexart will host an afternoon reception featuring guided tours by the exhibition organizers. As curators, we set out on an exploration for work that represents the ethos and praxis of expeditions. The works we found demonstrate a recurrent set of practices and sentiments that circumscribe exploration’s essence. It didn’t matter if the explorer was an artist or scientist, or if the subject was cellular or celestial. The human preoccupation with the frontier - where the knowable bleeds into the unknowable - holds steady at all scales. As such, we found that to explore entails the desire to search as well as the impulse to share. Abiding Clarke’s prescient vision, the launch of the first communications satellite ushered in an era of rapid technological innovation. In this new epoch, technology has extended human perception beyond the constraints of the human body. This promotes a culture of remote viewing, which paradoxically creates a greater distance between the viewer and the subjects or landscapes being viewed. These images deliver a disembodied understanding of the subjects they depict. As such, today’s world of places and materials has transformed into a world of representations and information. As inhabitants of this new world, we access images of our horizons in increasing detail yet do not clearly perceive the shaky ground beneath our feet. Katie Paterson’s Ancient Darkness TV responds to today’s networked reality and reproduces an incomprehensible image of cosmic time and space. Working with astronomers from the Mauna Kea Volcano telescope, Paterson’s Ancient Darkness TV records a transmission of ‘ancient darkness’ and broadcasts it on New York television station MNN. The work reveals darkness from the furthest point of the observed universe - 13.2 billion years ago - shortly after the Big Bang and before Earth existed, when stars, galaxies, and the first light began to form. Like many of the artists in Setting Out, Paterson’s work points to how remote viewing technologies are inherently unable to transmit a sense of the space they depict. Her work illuminates how technological media makes possible the material projection of place and time, and simultaneously presents us with an image that’s decidedly untethered to either. The word “dark” is often used to suggest the presence of the unknown. As viewers, we are literally left in the dark, wondering how and if this image allows us to comprehend our position in the universe. Or, perhaps, it simply leaves us at the periphery, oscillating between observation and imagination. As with Paterson’s Ancient Darkness TV, Heidi Neilson’s work deals with time, distance, and communication technology. Neilson’s ISS Roadtrip combines stills from a video clip taken from the International Space Station as it orbited the earth into a book meant to be viewed in a moving car. From the passenger seat, the reader turns each page of Neilson’s book and simultaneously registers the velocity of the car in motion. ISS Roadtrip inserts the remote landscape of space into everyday life and transposes the satellite onto the automobile. Yet, despite the car’s willful complicity, it fails to reproduce the experience of moving through celestial space. The terrestrial remains the terrestrial, and, instead, the reader suspends their sensation of reality so that they may follow Neilson into an intergalactic fantasy. Like Paterson, Neilson makes tangible an image of some distant periphery to which our lives are intimately yoked and infinitely removed. From these remote frontiers, Setting Out transmits images and artifacts that question the human desire for conquest over space and time. 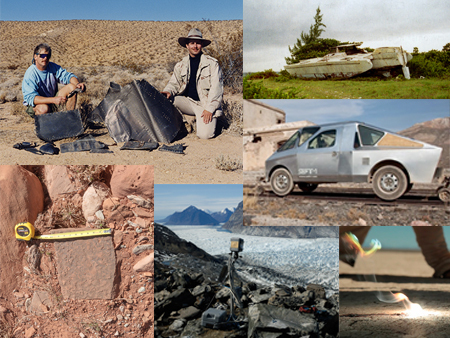 This documentation is the output of the curiosity that propels the explorer’s work. It reveals the desire to collect and share evidence of celestial and terrestrial hinterlands. Curiosity dovetails the work of the artist and scientist. This process of coming together yields productive frictions and results in the commingling of differing methodologies, efforts, and approaches. 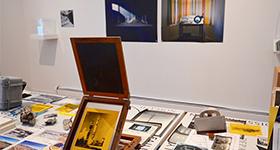 Setting Out is a 2015-16 apexart Unsolicited Proposal Program winning exhibition along with Life After Death and Elsewhere (September 2015), and Fencing In Democracy (June 2016). Shona Kitchen is an artist/designer who explores the psychological and social consequences of today’s technological landscape. The work is typically site-specific, research–driven and includes public art, gallery installation, and visual narrative. She holds an MA from The Royal College of Art, London. She has exhibited, lectured, and been published worldwide and has taught at institutions including: The Royal College of Art, Arts Center College of Design, and Stanford University, and currently serves as Department Head in Digital + Media at RISD. Aly Ogasian works across a variety of disciplines including sculpture, video, sound, drawing, writing, and photography. Her work explores the role of evidence within processes of searching and understanding, and draws inspiration from the history of film and photography, conspiracy theory, forensics and the history of science. She has exhibited in both the United States and Canada, most notably at Ceres Gallery in New York and the Center on Contemporary Art, Seattle. Aly graduated from Queen’s University with a BFAH in Sculpture and was recently awarded an MFA in Digital + Media from Rhode Island School of Design. She has been awarded residencies at Vermont Studio Center, School of Visual Arts, and The Arctic Circle. She is currently part-time faculty at Rhode Island School of Design. Jennifer Dalton Vincent is a Rhode Island-based artist/writer whose work examines the social and environmental outcomes of sustainable technologies. Her artworks and curatorial projects survey contemporary built environments and imagine their potential futures. Her art enlists her audiences to co-consider the cultural, aesthetic and material histories of the spaces in which they live and work. Before graduating from Brown University, she owned and operated a restaurant in Warren, Rhode Island, dedicated to sustainable food ways.